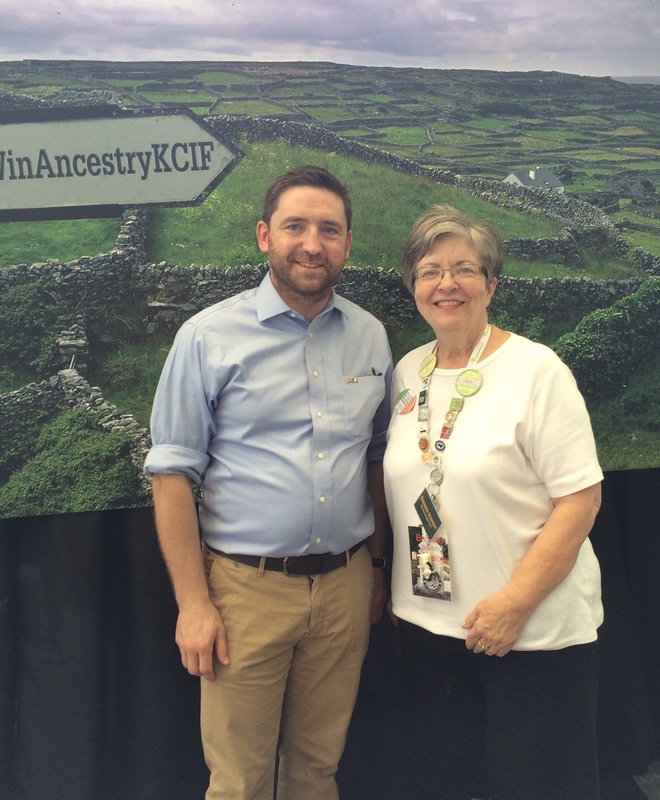 Adrain Farrell visits the Genealogy area of the Kansas City Irish Fest. Adrain Farrell the Consul General of Ireland from Austin Texas visited the Kansas City Irish Fest this year. The genealogy area is inside the Crown Center atrium. We don’t have to worry about rain with all of our computers and printers. We had 8 computer stations each with a volunteer helping people. This year we had over 100+ appointments during the festival. One appointment can mean 1-6 people from a family. It is so rewarding to help families connect with their Irish ancestry! Many families do not know where in Ireland their family came from. Oral traditions can be lost within 3 generations. I have a 3Great Uncle, James Smith lived in Friend Nebraska, who wrote a letter when he was trying to get his Civil War pension. My question for James, “You never asked your parents where in Ireland you were born?” Smith is a very common name for County Meath!